Ron Pitcher is president, Pitcher Insurance, Palatine, IL: 847/705-5560; ron@pitcherinsurance.com; www.pitch-erinsurance.com. Fastener manufacturer Termax Corp. hired risk-management service provider Standfast Global to create a cloud-based business-continuity plan, and executed an agreement with Belfor Property Restoration, specialists in disaster-recovery and restoration services. In the event of a disaster at the Termax plant in Lake Zurich, IL, Belfor pledges to provide Termax with a priority response for rescue and protection of its assets. And at no time is that adage more apparent than when a disaster happens within a manufacturing plant. The owner’s best friend at that point is a disaster-recovery plan. My client (and PMA member company) Termax Corp., a fastener manufacturer in Lake Zurich, IL, has made a couple of new friends during the last few months as it has worked, along with one of my risk-management service providers Standfast Global and its president Brian McCrane, to create a cloud-based business-continuity plan (BCP). It also has executed an agreement with Belfor Property Restoration, specialists in disaster-recovery and restoration services. In the event of a disaster at Termax, Belfor pledges to provide Termax with a priority response for rescue and protection of its assets. Belfor’s Red Alert priority response program is available through a dedicated emergency phone number, 24 hours per day 365 days per year. Belfor, a single-source service provider, offers emergency-response services including power generation, water extraction, board-up and barrier erection, temporary roofing, mold remediation, document freeze drying, structural drying, dehumidification, hazardous materials, electronics restoration, data recovery, duct cleaning, decontamination services, machinery retrofitting, vital records recovery, property salvage, contents restoration, project management and consulting services. If your plant is disabled by fire, flood, earthquake or other disaster, what would you do and how much time would you need to relaunch production? So goes a recent Automotive News report describing the automaker’s push to have suppliers develop and document disaster-recovery plans. Toyota already has conducted a census of its supplies in Japan, and now has embarked on a similar plan throughout North America with its Tier 2 and Tier 3 suppliers. To get started, Toyota has asked 400 North American suppliers to “identify any key parts produced by just one factory…and asked the 400 to develop backup production plans in case a single-source factory shuts down unexpectedly,” writes reporter David Sedgwick. Companies often are lulled into a false sense of security, believing that they are immune to a disaster. They could be in a location for several years and not suffer any loss greater than a roof leak. Or, business owners may believe that they don’t need a BCP since they have an insurance program that includes business-interruption coverage. They wrongly assume that should they incur a covered loss, their insurance will get them back in business and make them whole, as if the loss never happened. As an insurance agent for the last 32 years, I can tell you from experience that while business-interruption coverage is critical, it will not always make a business whole. Business interruption pays for loss of profits and continuing expenses, but it will not pay for lost customers. And, once your customers leave and take their business to another metalformer, because you can’t supply their orders, earning back their business when your company comes back online is not a given. Companies need to look at their recovery strategy as the proverbial three-legged stool: property and business-interruption insurance, disaster recovery and business continuity. Small to midsized companies would do well to look at what larger companies have done to create effective recovery strategies, and pattern their own policies similarly. It takes only a brief look at the Fortune 1000 to understand that they all have this three-legged approach in place. A company that deploys this strategy early will quickly realize that it becomes an affordable asset that conforms to its needs as the company grows. Planning for a disaster is critical and addresses many fiduciary responsibilities that a company has. But what happens when disaster strikes? The first 48 to 72 hours are critical. This is the window where the acid created by fire and water starts corroding equipment, and black mold begins its destructive journey. Taking steps to contain this damage not only saves thousands of dollars, it can determine when your business will resume operations. It is this critical stage where a friend is most needed following a disaster. Why Belfor, and Why the Cloud? There are many remediation companies that can address these issues, but having a relationship prior to the disaster will determine if that qualified company will arrive in a timely fashion, and with the correct equipment. It is equally important to have the relationship with a company that has the resources to respond to all levels of disasters. Termax and Standfast Global selected Belfor as the preferred vendor to address any post-disaster remediation needs they may experience because, in part, its footprint is national with international interests. Belfor identified each location at which Termax has interests and committed to a response time via its Red Alert agreement. 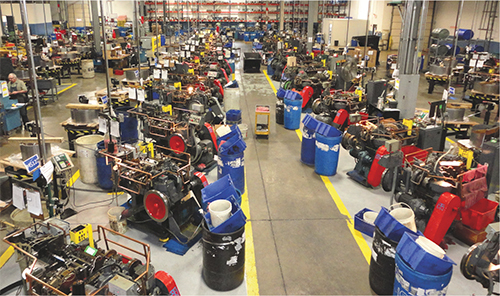 As with many manufacturers, the equipment Termax uses is not readily available off-the-shelf. So, being in a position to repair equipment rather than having to replace equipment promises to allow Belfor to return Termax to normal operations in weeks rather than months, following a disaster. The cloud-based plan is easily updated and available from any web-enabled device. …by attending a webinar, sponsored by the Precision Metalforming Association, on December 3, 2014. Presenter (and author of this article) Ron Pitcher will have plenty more to say on the topic of disaster-recovery plans for metalforming companies. Learn more and register to attend by visiting www.pma.org/meetings.